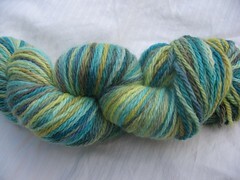 “Songs of Joyful Trees” is part of the “Songs of …” series, where every colorway is named from a verse found in Psalms. Many of the Psalms have been turned into modern-day praise songs and choruses. This verse is actually found in two songs that I can think of. We love to sing praise choruses in our home. Mainly because my 3 year old daughter loves to sing. We decided early on that we wanted her singing music that would help her to grow as a person. It is so sweet to hear her in her room singing about the Lord. She enjoys the music so much, as do we. It lifts my spirits to sing out to the Lord. We constantly have praise music on in our home, for our sake as much as the children’s’. The Lord is righteous and there will come a time when He will judge the whole earth. And at that time, the Bible says, the “Let the heavens rejoice, let the earth be glad; let the sea resound, and all that is in it; let the fields be jubilant, and everything in them. Then all the trees of the forest will sing for joy.” The earth will sing of His glory as it does now. I just look around and see how each day, nature points to a Creator. Our Lord lovingly formed the earth and each and every creature on it. He is good and the trees know it and sing about it. Therefore, “Songs of Joyful Trees” was named in honor of the trees and their joy for God. Dyed in many shades of green and a bit of yellow, “Songs of Joyful Trees” is here to remind me that nature knows that God is coming to judge us. Do we understand that too? Ruth 4:13,14 & 17 -” So Boaz took Ruth, and she became his wife. And he went in to her, and the Lord gave her conception, and she bore a son. Then the women said to Naomi, “Blessed be the Lord, who has not left you this day without a redeemer, and may his name be renowned in Israel! … And the women of the neighborhood gave him a name, saying, “A son has been born to Naomi.” They named him Obed. He was the father of Jesse, the father of David. Ruth is one of my favorite Bible stories. I love the story of this young Moabitess woman. Her mother-in-law, Naomi, had come into the land of Moab when Judah was in a famine time. God had commanded the Israelites to stay, but this particular couple left from God’s protection. They traveled to a foreign land and lived there. Their sons married local women, also a no-no. When Naomi’s husband and both of her sons died, she turned bitter. One daughter in law decided to stay with her family. However, Ruth told Naomi that she would go with her back to her homeland. Though Ruth wasn’t born as an Israelite, she understood their God and longed to serve him. She showed true love by honoring her mother-in-law and vowing to stay with her. They traveled back to Bethlehem, alone and without a husband to provide for either of them. They needed desperately to eat. Ruth volunteered to glean in the fields (basically pick up the left over grain the harvesters had dropped) and gather it for them to eat. Boaz, Naomi’s cousin, saw her and felt affection toward her. He purposefully had his people drop extra grain. He had heard of her kindness for her Naomi and wanted to repay her by sharing his crop with her. When Naomi realized that she had been in Boaz’s field, she knew that she would elicit his help. Naomi sent Ruth to ask Boaz to be her kinsmen-redeemer ( a tradition where when a young child-bearing woman was widowed, then a family member would marry her and produce offspring to carry on the deceased man’s name.) Boaz accepted her and redeemed her. Thus, Boaz and Ruth married and together they bore a son. His was name was Obed, and he was the father of Jesse, who was the father of King David. Hence, Ruth bore a son whose linage would eventually lead to Jesus Christ. Naomi had been raised a Jew. She knew all the traditions and customs. Yet she and her husband disobeyed the Lord and left and then allowed their sons to marry outside of their religion. And when trouble came upon her, she was bitter. Yet Ruth had never heard of this God, and was able to redeem her family through her love, servant hood, and faithfulness to Noami and Noami’s God. It was because of her character that Boaz was willing to redeem her. How I respect Ruth and how true she was to God. And he blessed her by her linage, even though she wasn’t born a Jew. 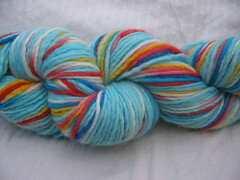 The colors in “Ruth” are designed to represent parts of Ruth’s life. The red is her pure heart, that loved her God and her mother-in-law, Naomi. The pink stands for her gracious character. She was a beautiful woman who was graceful in spirit. And the brown and green are for the land that she worked in, where she met her husband Boaz. She was blessed in her life, and I pray that “Ruth” blesses you as well. 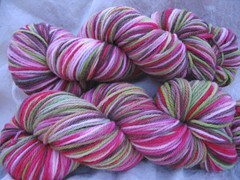 “Morning Glory” is such a special colorway to me. 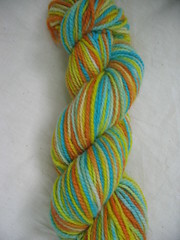 It was one of the original ones that led to my dyeing adventures. 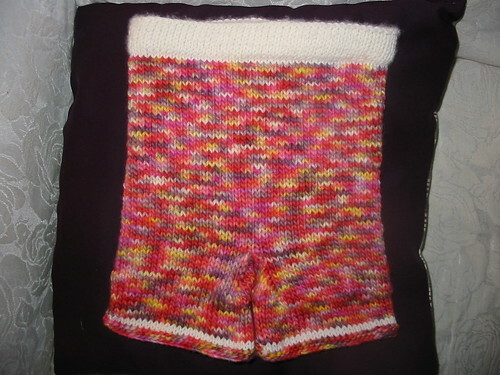 I wanted my oldest daughter to wear wool, but what we already had in the house was “too hurty”. A super kind mama sent us some undyed wool. 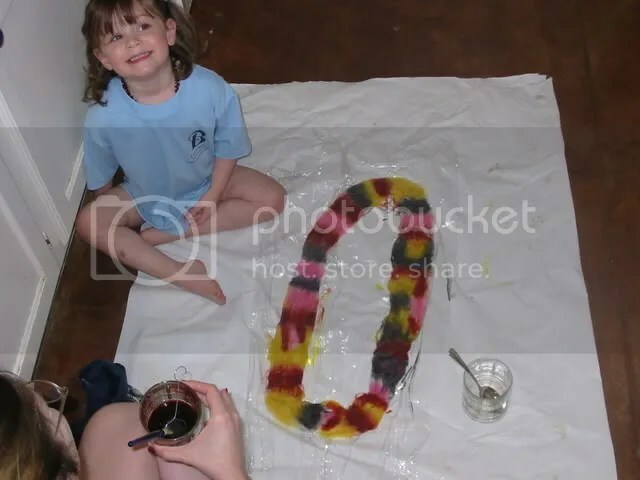 Since at the time, I was just using food dyes, I let her help. She had a blast with the first one we did. So here’s she is in round 2. Today’s version is a bit different than the original. I lightened up the purple, and it has more merigolds and oranges in it. The colors are much more rich and vibrant. 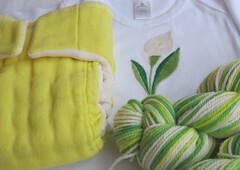 And there is none of the yuck that happens when yellow and purple meet! I came up with the name Morning Glory when looking for inspiration. Someone suggested that it was the colors of a morning glory flower. It also happens to be the birth flower for my birthday month. I got to thinking about the double meaning, how it also represents the amazing sunrises. Our God is not shy in displaying His glory! I just look around everywhere and see evidence of Him and the work of His hands. That’s why this was so special. 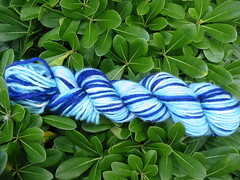 It was the first colorway that I had dyed that was named in honor of the Lord. I pondered on naming it for God. I had been struggling a bit with feeling close to the Lord for a little while. All of the sudden, I started thinking about Him constantly. I looked at the world with new eyes. A couple of weeks later, I was in church and was following along in the Bible, and “names” just popped out at me. 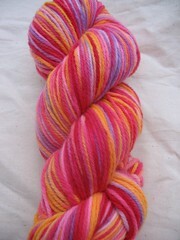 Instantly, I knew what colors I’d translate them on to yarn. It’s as if God gave me a pair of color glasses and naming glasses and I could really see. The world transformed in front of me and so did my faith. I found myself longing to spend time in the Bible. I longed to see the ultimate artist at work. I found myself admiring the colors in nature. I found myself in awe of God in a whole new way! What passion overtook my soul. I had a vision and a new meaning. I look forward to spending time with Him, learning from Him and growing in Him. I felt a very distinct call to a ministry. I felt as if I had to share the truths God was revealing to me in my dyeing and researching, therefore I created this blog to go along with my business. I love being able to share the things God is teaching me and creating beauty that is found in His word. Each and every colorway I create will have a verse and meaning found in the Bible. I actually think that I’ll have an endless supply of ideas. The Bible is a very big book and takes place over a very long period of time. I am so pleased that I can serve Him in something that I love. He is my “Morning Glory”! It was really only after the birth after my 2nd daughter, that I understand what postpartum depression was. It was a very awful stage of my life. Thankfully, it only lasted a short time. I was very angry and cried all the time. I overreacted about everything. I couldn’t understand myself and why I seemed unable to control myself. I sought help, both from the Lord and from medically. After a couple of months, really I had returned to “normal.” What a relief! I learned to look start looking for the good in things. To look for all that could be good was such a change in perspective. Shortly after this event, I started dyeing. I was so thankful for my life and so thankful for the ability to control myself. Thankful for laughter and thankful for life. Rejoice! Praise the Lord! My dyeing is for the Lord. It is to glorify Him. I long to please Him and make Him known. It is my hope that in whatever I do, that “Christ is proclaimed, and in that I rejoice!” I long to be able to say with confidence, “For to me to live is Christ, and to die is gain.” I am growing closer to Him each and every day, and each day, my heartbeat changes as He draws me closer. So in Him I “Rejoice!” To signify the joy I now feel, I chose bright colors. The bright orange, yellow and turquoise reflect the change in status after my world brightened. “Island of Innocence” comes from the book of Job. Job is a story of a man who is faithful to God. He walks with the Lord daily. It’s such a neat book in the Bible, because it allows us to see what goes on “behind the scenes” with God. Basically, Satan is looking for someone to test and God suggests Job, because his faith is so strong. God allows Satan to take everything from Job except his wife and health. Still Job remains faithful to the Lord. Then God releases the protection of Job’s health to Satan, and Job is afflicted with painful sores all over his body. Yet again, Job clings to his God. The verses I found “Island of Innocence” occur during a scene where Job is conversing with his 3 friends. He is wondering why all this has happened to him. His friend, Eliphaz, believes it is because of his sin and that he needs to repent. Yet, Job has already repented before the Lord. God comes and answer Job. He didn’t really answer any of the questions that Job had, but instead pointed toward the natural order of the world and Job’s lack of knowledge. For if Job didn’t understand the workings of creation and life, then how could he understand the mind and character of God? God is almighty, powerful and righteous to judge. Job is only a man and can not certainly understand how God is orchestrating everything to work together for His sake. It is the understanding of this concept that makes me thankful. Our Lord is holy and perfect. He can only tolerate perfection in His presence. Yet He is a merciful God, who sent forgiveness to us all through the sacrifice of His son, Jesus. And somehow, Job understood all this. That is why he clung to his faith, despite the turmoil in his life. And in the end, God blessed the latter part of Job’s life much more than the first. I only pray that I’ll have a faith like Job’s. During the rocky times of the storm, I long to cling to the Lord like Job did. 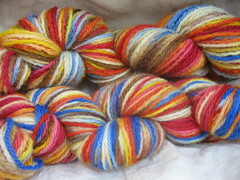 “Island of Innocence” is dyed as with shades of brick red, orange, yellow, brown and blues. I see it as the storms in Job’s life, the upheaval of his possessions, and the rock of faith that allowed him to get to the other side. “Royal Robes” is the last in a three part series, along with “Birds in Heaven” and “Lilies of the field. My mom just took me shopping this week. I have been a little frustrated about how my clothes fit. I haven’t had to time to exercise the way I did in college. And then there’s something about carrying a baby (or 2), that can alter your body shape. I really haven’t been worried about it, but my mom really blessed me with this gift. It’s nice to have clothes that flatter your figure. I had some that fit before, but I’m much more modest than I was a number of years ago. I found myself wearing the same few things over and over. There’s nothing wrong with that. Nor in the fact that I got some nice clothes. But I remember how different I was in high school. I couldn’t wear the same outfit twice in a couple of weeks. I actually wrote down what I wore each day, so that I could keep track of it. I tried on several (like between 6-10+) most nights before I settled on something. I always had to look perfect. I think I looked nice in high school. Yet, I was very shallow and materialistic. I found myself making really stupid decisions. Over the years, thankfully, the Lord has taught me to trust in him. I’ve been learning about really looking at what is on the inside of people and not the outside. I’ve been teaching that to my children and trying to really examine myself also. I truly desire to have beautiful character, rather than mere physical beauty. “Royal Robes” was designed to have colors of a rich, deep indigo and light blue. These colors together reminded me of a what King Solomon’s robes might have been like. Yet even Solomon dressed in all his“Royal Robes” was designed to have colors of a rich, deep indigo and light blue. These colors together reminded me of a what King Solomon’s robes might have been like. Yet even Solomon dressed in all his glory, did not even compare in God’s eyes to the simple lilies of the field. What I’ve come to understand is that God desires for me to simply and wholly trust in Him. As I seek after God, and his righteousness, God will bless me with all that I truly need. For Easter, I did a collaboration with Tinkle Traps. 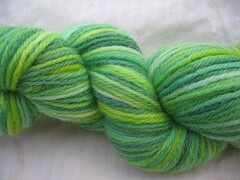 As Easter approaches, I finally got around to dyeing up my “Lilies of the Field”. I wanted something special to signify this wonderful holiday. And also wanted to let you know about the significance of this special flower. The Horticulture Department at Texas A&M University (my alma mater), had some fascinating information on the Easter Lily. Each holiday is marked by cherished traditions that bring joy, comfort, and warmth, and provide continuity from one generation to the next. Easter has its share of traditions: egg decorations and hunts; gift baskets and chocolate bunnies, sunrise church services, parades, and, of course, the Easter Lily. For many, the beautiful trumpet-shaped white flowers symbolize purity, virtue, innocence, hope and life – the spiritual essence of Easter. Often called the “white-robed apostles of hope,” lilies were found growing in the Garden of Gethsemane after Christ’s agony. Tradition has it that the beautiful white lilies sprung up where drops of Christ’s sweat fell to the ground in his final hours of sorrow and deep distress. Churches continue this tradition at Easter time by banking their alters and surrounding their crosses with masses of Easter Lilies, to commemorate the resurrection of Jesus Christ and hope of life everlasting. It seems the thirteenth-century Barthololmeus Anglicus had this in mind when he wrote: ‘The Lily is an herbe with a white flower; and though the leaves of the floure be white, yet within shineth the likeness of gold.” So goes the saying, ‘To gild a lily is to attempt, foolishly, to improve on perfection.” To many artists and poets it seemed that, if any flower could have one, the lily had a soul. In yet another expression of womanhood, lilies had a significant presence in the paradise of Adam and Eve. Tradition has it that when Eve left the Garden of Eden she shed real tears of repentance, and from those remorseful tears sprung up lilies. The spiritual principle held here is that true repentance is the beginning of beauty. Christ mentions these beautiful flowers. They are beautiful and lovely to look at. And they have come to represent the miracle of his death and resurrection also. As we can trust and believe that he died and rose from the grave, we also can trust him to meet each and every one of our needs. The lily reminds us not to worry, but to put our faith in him. “Birds in Heaven” is the first in a three part series, including “Lilies of the Field” and “Royal Robes”. Before kids, both my husband and I were in commission sales. I loved it, but it was a high stress job. You’d never know what you paycheck would be. Would you do really well or just okay? Would it be an up year or down year? Chad decided to stay that route, and is still in commission sales. The first year I stayed home, I think it was really tough for me not to worry. (Confession: I worries a TON!) But God has really taught me to trust in Him. I know that my husband is good at his job. I know that he feels like he’s exactly where God wants him to be, career-wise. So if God put Chad there, won’t he provide for our family? Of course he will. And if he gave me everything I own, won’t he take care of it? We are God’s special creation. Out of all the things he created, humans are the only ones created in HIS image. He loves us and cares for us. And if he provides for them, by feeding and protecting them, won’t he do the same for us? He says that he will, and in that I have to trust. God is incapable of lying, so I can trust that when he says not to be anxious. I have been praying about not being anxious and slowly but surely, God is taking care of it. “Birds in Heaven” was designed to represent the colors of a clear blue sky and the beauty of birds in flight. A canary, cardinal and blue jay set against the white of the clouds. These beautiful birds that He created and cares for are so insignificant to how much he cares for us. Meditation. It is a very popular word these days. Many people meditate often. Yet in Christian circles it is not a very popular word. However, the word of the Lord tells us not only to meditate, but to meditate day and night. But this isn’t just about sitting in a calm place and breathing deeply. It is so much more than that. God commands us to meditate on his word both day and night. A number of years ago, I don’t know that I would have really believed that to be possible (without being insane, of course). But now that I have children, I think differently. I want to guard their little ears. I want to fill their heads with things that will help them for the rest of their lives. Therefore, we listen to scripture as much as possible. We’ve been acquired many CD’s that have scripture put to music and Bible songs. It is the sweetest thing to hear my 3 year old daughter singing herself to sleep, ” You are holy, holy. Lord of Heaven and Earth.” But it has become such a part of our daily lives that she doesn’t know any difference. I , on the other hand, can certainly see a difference. My demeanor is more upbeat. It’s hard to say something negative when your daughter is singing “do not let any unwholesome talk come out of your mouth.” And dealing with her has sent me back to the scriptures. Many days, I find myself longing for some time just to gather some wisdom from the Bible. In searching the word and spending time with the Lord, I’ve grown and prospered, just like a fruit tree. “Songs of Meditation” is part of the “Songs of …” series, where every colorway is named from a verse found in Psalms.